This is the voice of Mr. Yossi Atlas owner of Anchor Auto Lease, Inc ( previously owned Wheels to Lease). He was looking for the owner of CJ Studios. Mr. Atlas is a member of the Lakewood Va’ad and takes direct orders from the CEO of Beth Medrash Gavoha Mr. Aaron Kotler. Mr. Atlas is known to be a shrewd businessman who will smile at you and give you the best customer service until your bill is paid up. At that point there is no one to talk to. Lakewood Vaad member Yossi Atlas threatening Ateres Tziporah Lubavitcher father that tried getting daughter into a school. Yasher koach to the owner of CJ studios for standing up to the Jewish Taliban if Lakewood. Uncover their motivation and make it known. Find a way to eliminate it from each vaad member and they will slowly fade. I hope this cumbag loses business from this debacle. I called him to voice my displeasure, he’s so arrogant. Can someone Please post all the Vaad members phone numbers and BMG’ s main number to the uber boss and voice your disgust over this VILE conversation. He must hand in his resignation immedialely. This is Sedom not a Torah center. Can someone OPRA all his dealings with the town and our $$$ in regards to his sale/lease of cars buses etc. Curious to see if their was Competitive bidding as required by law??? not really sure what fuss is about. Lame call. Nothingburger. This mushchis jas been thugging lakewooders for years. Hi lame call,,how would you feel to be told by a supposed frum yid to get out of town with your “baggage”? He isnt the only rabbi to tell people 2 leave town. Rabbis blech,cohen& shainkee have been doing this for years. The phone call was placed by VAAD member… Years ago he was given the job of helping to get boys into cheder and sometimes he helps girls as well. But instead of helping, he very often uses this position to help the vaad make sure that certain people toe the line in order to get accepted to a school. I am not only talking about using children for political big mouths like myself. That is evil enough. I am talking about pillars of our community that have money and influence that have had their children not let into schools until promises were made. In other words, the VAAD is basically a mafia. Now along comes this lubavitcher guy. He makes a public stink. He gets hundreds of people behind him to question a system that punishes children and families that simply want a Jewish education. Now, that lubavitcher gets behind a school dedicated to accepting everyone. Now the VAAD has a serious problem. Any successful school that accepts everyone would seriously reduce their ability to wield influence over families that need schools. Whether for political or just plain shakedowns of wealthy people. The party would be over. So… anonymously called this father and subjected him to veiled threats. He made him feel unwelcome in our community, while at the same time being a part of a group that is benefitting monetarily from Lakewoods irresponsible growth. This phone call is proof of everything that many of us have been saying for years. The VAAD cares about one thing. THEMSELVES…, I was never scared of you or the VAAD,and I never will be. Bit after thousands of people hear this phone call, you will all be revealed to be the joke you always were. I want to make clear for the public record: I had no idea who was calling me. I had posted my number here as a commenter seemed to imply he could fund the school. 30 minites latter I got a call on a blocked number asking to speak about the school. For all I knew rechnitz was call. It took me a few minutes to figure out this guy clearly didnt care and certainly was not giving money. For record all of my phone calls are recorded. Not just this. After hanging up it forward to a three friends and said look at the call I just got from some yukel. I forgot about untill 1230 at night when a friend told me the call was going viral. Shock to me. Whats so exciting on idiots calling my phone. Ok this is interesting. Yesterday morning I woke up to a slew of emails about who it was. Suddenly im a hero. Had I known it was a vaad memeber i probably would have spoken diffrent. I leave those details to your imagination. Nonetheless I will reveal that Rechnitz worked hand in hand with the vaad to secure the funding that has saved the school. I have ok agenda here folks: Spread a little light in a place where darkness has held alot of ground. I hope ateres tziporah will be able to set that example. What the vaad is up to or not I DONT GIVE A DAM. ENJOY THE WORD. I Just want to see a little light and let that shine forth. Obviosuly hasgacha protis had it set that this clip would go viral. I didnt ask for it or try for it. It happened by a friend who felt the world needed to hear. He didnt ask me. For whatever reason Hashem wanted it public. Now it is. Lachaim, lets all do our part to spread the light and do another mitzvah that wil help another Jew each in our own way. the Lakewood vaad has had an agenda with this school for many years now. from the time Mrs. Grama left they have been hoping the school would fail. they even went to the rosh ha-yeshiva to claim the principal is unfit to run a school. the main supporter/owner at the time had the wrong intentions with regard to chinuch and running a school. etc.. the list goes on & the story gets worse. regardless of their attempts to sabotage the school there must be a place like this. Mr. atlas is a patsy for the vaad he did not even know their intent. Lakewood has changed it is time for the vaad to change too. It’s there hit the arrow on the bottom. of the pdf file. Hanugid R’ Yossi just hosted the Vishnizer Rebbe (Monsey) and last year singlehandly supported the VishnItzer Rebbe (Bnei Brak) in Lakewood and imported an English speaking R ‘ Aron Kotler to grace the Melava Malka while he ‘masba”ked’ the Rebbe wearing the Lvush looking like the Heiligster Chusid in Shtut. Aside fromhis Vishnitzer/chasidsher askonus he was instrumental in many of the Shtuts issues over the years, and the velt should know he’s an Osek l’shem shomayim. For example when A local maidel was kidnapped and her identity was posted all over the public media, he was the koach behind dismissing the chief of LPD for such Menuvolos. Nebach, Vchen Loi Yeoseh b’yisroel. B’kitzur, against this background of Askunus, he definitely did the right thing to call someone who posted their number for anyone who wanted to talk about the school issue. As a successful businessman, politician, and local liaison for the community at large, he attempted to discuss a sore issue that has plagued private schools in America since time immemorial. However he was met with anger and desperation, rather than a conservationist. His repeated eferences to Monmouth Bais Yakov are clear signs that he had not done his homework. I wonder what the kids where malkiel kotler went to day school on madison av were called. I bet they too were called the “worms” “drek” or worse. Hanugid R ‘ Yossi just made a Chanikas habayis for his Tzadikel in Toms River B’hishtatfis the Monsey Vishnits rebbe, this past week. The gantze chasidishe oilam came to be mekabel punim. Surely everyone halts em a Shaina yid. So, he leased buses to the Township paid for by Federal grants disguised as Local transportation needs, does that Mach em veiniger a Shaina yid? So, he buddied with the LPD and got away with some tickets, does that Mach em vainiger a Shaina yid? So, he tcheprred mit an oislandishe and farikte chabadtzke who’s came to town hoping to make this yeshivishe/chasidshe shtut run according to the minhagei Crown Heights, by affording every Neshomo a place in our education, dus Macht veiniger a Shaina yid? Der emess is, many of inzere would’ve done the same. Now that he did and was recorded, nebach, toigt er Oif kaporos! Lakewood has a right to remain Lakewood. Ha’Goon yossi should practice what he preaches and move back to ny where he came from & leave lakewood at once. Lakewood is better off having​ “worms in Thier salad”then rotten to the core askanim. He came from Queens, but after graduating Vishnitz married and is shvuggers with the Vaad LPD liaison he started kollel life in BMG. So, he’s fin inzere all the way. But that Chabadtzke came from crown heights married and with his baggage, moved to Lakewood. Never in Kolel. Never in BMG. Now, who should go back to where he came from? The famous Chazon Ish told the infamous BenG that an empty ship (freiers) must make place for the loaded ship (frummers). Thank you R’ Joe, for speaking up for the original and prevailing Lakewood, as representative of the Vaad, and CEO. R’Ahron is shepping nachas from his chasidisher nuchfolger and keeping the shtutd Rein from outisde influences! If your trying to keep the shtut of lakewood clean may i suggest you start by getting rid of the asken who claims to represent the yiddin of lakewood, who was caught with a local אשת איש. And ruined sn entire family. If your not sure who im talking about I can arrange to have his name plastered all over town. please do. what are you waiting for. Kiddish at the original Vishnitz on Clifton Avenue now in Trtailers while the 8 “Monsey” and 3 “Bnei brak” rebbes resolve who will call themselves “vishnitz lakewood”. The Flea Market deal is gone. So without a “kiryas Vishnitz” the lost souls don’t have a place to call home. Toms River vishnitz is renting space in the. Belzer trailer, not big enough for a kiddish size this huge. Anyway most of these are the Shvantzunos branch of Vishnitz, his kiddish is for the mainstream Batshi Vishnitz. Alle chasidim zolen huben a lechtige shabbos in Der heilige shtut al pi nisach vishnitz, in farbrengen bei botte fratig nacht biz Der inderfrei shois, zingen Menicha v’simcha….VA va va vai…..
Did you say Flea Market? So the true fleas in the Lakewood salad are the Vishnizers! Ahavas Yisroel was the original Vishnitzer sefer and manhig of the illustrious chasidus. Before chabad and other misrepresentations of the derech habal shem hakodoish. Please, meet me at the shtibel tonight, botte fangt ohn b’erech 11. Just prepare to stay for Lange vareme heilige fratig nacht b’tzel knofecho and not in the cozy vareme bet with the fratig tzenacht mitzva vaibel. Git shabbos, nuchen heise mikveh. Fargess NISHT heise mikve far Der heilige fratig nacht. At Strulovitch you can be yoitze yedei shneyhen. Yossi “Joe” Atlas. Oy! Where can I even begin? So much to say about his “ehrlichkeit” in not paying people that have done work for him. So much to say about his “tzidkus” as he ignored lakewood mishpachos that needed a school for their child, and making them feel like unwanted worms. So much to say about his “anivus”. So much more to say about his ibergegenkeit to those that aren’t in a position to give him kavod. There’s just so much to say about how great of an idea it is to keep this personality on the shtut VAAD as a representative of communal integrity and sterling reputation. Though, the truth is, that he’s just too good to remain on the VAAD. His irreproachable caracter is better left to operate on its own, as a side show, rather than continue to bring harmful ill-repute on such a reputable body. There are plenty of other more-refined gangsters to take his place, if need be. Who is the Adulterer that Yehuda Levin is ranting about on youtube Levin11? Suport his business by riding the L bus; so he can renew the federal sponsored lease. I condemn the tone of voice but the point is well taken that the school cries wolf every year and it is about time that they get their act together. 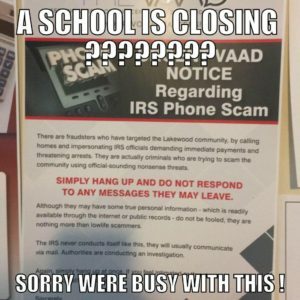 No one wants this school to close down and anyone who says the askanim want to close down the school is spreading knowingly “fake news”. Also the mass exodus of parents looking to leave the school each year puts a huge strain on the community and it needs to end. Last but not least making such a recording public is an issur deoraysa. I appreciate the courage to stand up against authority but it must be done in a way which is halachicly Kosher. You'r a first class hypocrite. Bullying people especially anonymously is also an isuur d’orysa. Find a kosher way to relate your message. Mazel tov on the engagement of bas Horav Hanugid R’ Yossi v’Mindy Atlas! Advice for Reb Yossi and other VAAD members: Change your game now, because more and more people willing to speak up are moving into the house you fought so hard to get a variance. Wow, this was awesome. Keep writing this kind of posts, you will get a lot of people to this page if you continue writing this.